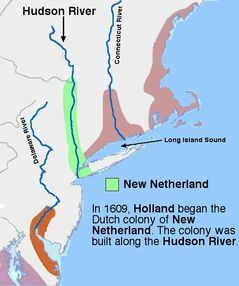 Henry Hudson had claimed land for the Netherlands, or the Dutch. This land was called New Netherland. The Dutch West India Company controlled the settlement and wanted to use this site as a port. Few people from the Netherlands wanted to settle here. Because of this, settlers from all over Europe came to New Netherland to live. Where is the colony located? Puritans settled in present day New York. Peter Stuyvesant was the Dutch governor of New Netherland, however he was not well liked. The English wanted to take the land from the Dutch. When they came the settlers did not put up a fight, as they hated Peter Stuyvesant. Because of this, New Netherland became an English colony and was renamed New York in honor of the Duke of York.